The WSO-UV Ground Segment includes all the infrastructure and facilities involved in the preparation and execution of the WSO-UV mission operations, which typically encompass real-time monitoring and controling of the spacecraft, as well as reception, processing and storage of the scientific data. The Ground Segment is developed by Russia and Spain that will coordinate the Mission and Scientific operations and provide the satellite tracking stations for the project. The Ground Station Control Centre and Ground Communications Subnet, which provide downlink-uplink communication between the spacecraft and the rest of the Ground Segment. The Mission Operations Centre, mainly in charge of providing the real-time spacecraft monitoring and control function. It also includes the flight dynamics function (orbit determination and attitude reconstitution). The Science Operations Centre (SOC), responsible for adequate scheduling and supervision of the WSO scientific operations. The SOC also comprises the Analysis System, responsible for calibrating the observations as well as verifying and processing the scientific data. There will be two SCCs, one at INASAN, one at UCM. The UCM premises will be hosted by JCUVA. 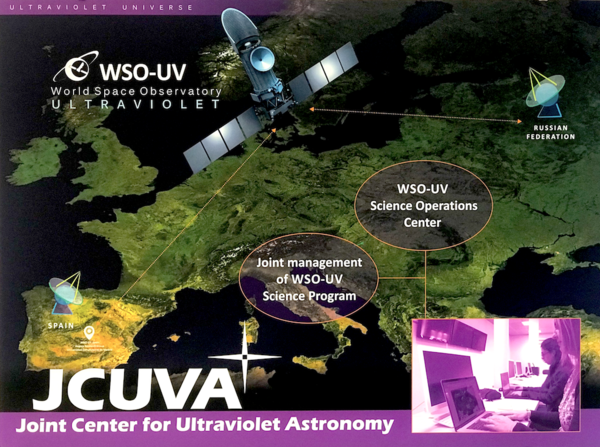 The WSO-UV Science Archive (WSA) is not a simple safe place where to store the data, but it will provide and easy and efficient access to the contents, as well as basic processing capabilities aiming to provide the user with the required services to allow him/her maximizing the amount of retrieved high quality data without requiring major expertise in data processing and managing techniques. For this purpose, WSO-UV science Archive will be VO compliant. WSA is responsible for providing secure and persistent storage for data belonging to the WSO/UV mission, and allowing authorized users to access to this data in a fast and reliable way. WSA is the mission legacy that guarantees that the mission products will be usable by future users, for research, education and engineering analyses, well beyond the S/C life expired and the spacecraft operations ended. It will allow the astronomers from any country have the opportunity of accessing the high-quality data of the mission at any time (once the data is made public).